In design, function and size, the Linda Jewelry Box is the ultimate jewelry storage solution. With a walnut finish and thatch suede interior, this revolving, double-sided chest with its numerous compartments and hooks will handle maximum jewelry storage in a minimum space. Features a door with a mirror. 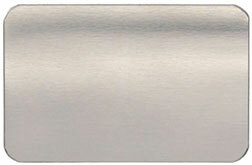 Brushed silver nameplate may be attached to the center of the top for personalization (optional). Measures 9 7/8 x 9 7/8 x 16" H. Product code 682WTS. Click the button below to add the Linda Walnut Jewelry Box to your wish list.